Time to throw conventional wisdom out the window, at least according to a new study. The study’s author spoke about the findings, published in U.S. News and World Report, but the organization isn’t listed. Using data from a 2007 national survey of nearly 78,000 children from ages 3-17, researchers found that autistic children are just as likely to live with two married parents as everyone else. The numbers are by no means encouraging; the divorce rate of parents with autistic children was 64% versus 65% for non-autistic kids, but it may debunk the stat thrown around that suggested 80% of parents with autistic children would eventually split. Studies are often tricky, since articles generally report the findings but rarely explain the methodology used to get there. The discussion and conclusion sections of a study also note flaws in their findings for future researchers to note when they conduct their own studies. However, given the high levels of stress that do come with an autistic child, parents may find some solace knowing that everyone else isn’t necessarily luckier. Relationships are tough to match from the start, but that’s another blog. However, the fact that something other than autistic kids is getting press time is noteworthy. The parental aspect plays a large role when stories on children are published, but the trials and tribulations of the parenting role is often ignored in mainstream coverage. Spending more time on parents would be a fruitful topic to harvest for journalists. We know a lot about how kids with the disability interact with the world, but many parents still drill me when I bring up my condition. Perhaps it’s time I and fellow reporters change course and discover the treasure of information that can be found with parents who raise autistic kids. But their heads are well above the sand. A survey of over 1,500 parents conducted by the University of Michigan, in a story reported by the Associated Press, finds that 25% of those surveyed believe the now bogus connection between autism and vaccinations. However, the survey also found that 90% of respondents believe vaccinations are effective at preventing diseases in healthy children. The survey was held last year, before the General Medical Council ruled Dr. Andrew Wakefield’s actions dishonest and unethical after a 1998 study suggested a link between autism and immunizations. The article also reports doctors taking a tougher stance, asking parents who refuse vaccines to find another doctor. The survey is also a sign for doctors to design better ways to communicate how scientists reached a conclusion refuting vaccinations as a cause of autism to parents. Even Autism Speaks, not without its own controversies, encourages parents to vaccinate their children. 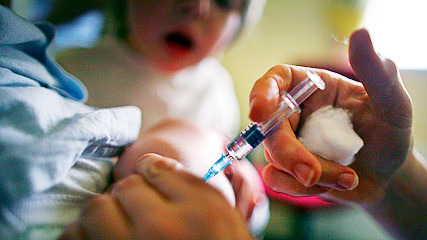 The CDC reported measles outbreaks in five states in 2008 from unvaccinated school-age children. The survey confirms what I speculated when word first broke out about Wakefield’s ruling and The Lancet‘s retraction of his study that spurred the hottest firestorm in the autism community. Correcting 12 years of false information will take just as long, if not longer, if history is any precedent (there was a 124-year waiting period before the United States granted women the right to vote and 189 years before the Civil Rights Act finally gave minorities equal rights under the law, although prejudice still exists). Surveys aren’t without faults, but the percentage of people believing the discredited theory is lower than I expected. What this also indicates is a lesson for anyone, including aspiring journalists when it comes to addressing controversies. Explain information as clearly as you can to your audience. You’ll be surprised at how many people believe untrue things simply because no one told them the right information. Communication is the reason print reporters, TV reporters and announcers often use simple words in their stories, because that saves us a boatload of time trying to define more complicated ones that you might see in scholarly work or the National Spelling Bee.